Itchiness is an unpleasant skin condition that can affect the skin on any region of the body. There are multiple causes of itching. But they all impinge on the itch receptors present in the skin. When these itch receptors are stimulated, an itching sensation is felt in the affected region. The itching sensation is limited to the skin and is not felt in the internal organs due to a lack of itch receptors inside the body. In some cases, itching of the skin occurs by itself. No other signs or symptoms accompany the itch in these cases. However, an itch could also occur alongside a skin rash in the affected skin area. The itching sensation is a normal defense mechanism that alerts a person to the presence of some irritating substance on the skin. Why does the abdomen itch? Itching induces the physical act of scratching the affected skin area, which can be thought of as an attempt to remove the irritating factor from the skin. However, prolonged itching and scratching can also damage the skin further and cause bleeding. Itching of the skin on the abdomen is also referred to as an itchy stomach in layman terms. Since there are no itch receptors in internal organs such as the stomach, there cannot be an itching sensation emanating from the stomach. In the layman language, the terms “abdomen” and “stomach” are used interchangeably. However, they are two distinct terms that refer to different parts of the body. The stomach resides within the abdominal cavity. Therefore, when somebody refers to an itchy stomach, it can be safely assumed that the person is referring to an itch on the skin of the abdomen. Read more on itchy skin rash. An itching sensation on the skin can occur due to a multitude of causes. The reasons for an itchy abdomen are largely the same as the reasons for an itch elsewhere on the body. However, there may also be some specific reasons for itching on the skin of the abdomen (such as pregnancy). 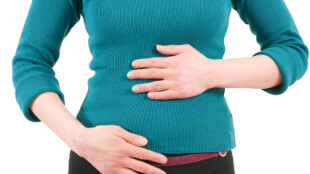 The following are some of the common causes of an itchy abdomen. Lack of proper skin hygiene is a very common cause of itchy skin. Throughout the course of a day, our skin accumulates a variety of irritant substances such as sebum, sweat, dust, microbial flora, and dead skin cells. Bathing daily removes these skin irritants regularly from the surface of the skin and keeps the skin healthy. Not washing the abdominal area properly during bath can lead to an itchy abdomen. However, excessive use of water and soap can also promote skin irritation. One should dry the skin thoroughly with a towel after bath. Another common cause of itching is dry skin. The moisture of the skin is maintained by secretion of an oily substance from certain glands in the skin. These skin glands are known as sebaceous glands and the oily substance they secrete is known as the sebum. Dry skin could occur due to a variety of reasons, such as excessive bathing, use of antibacterial soaps, cold and dry climate, dehydration, using excessively chlorinated water for bath, and chaffing of the skin. A dry skin may also occur in certain skin diseases. In most cases, an effective remedy for dry skin is to use a good moisturizer. Sweating is a normal thermoregulatory mechanism of the body that functions to keep the core body temperature in check. However, sweating can sometimes become excessive and lead to itching. Excessive sweating can occur due to a variety of different reasons. For example, one may sweat excessively in hot and humid weather or while wearing skin-tight clothing in warm weather. In some individuals, the sweat glands are inherently overactive, causing these people to sweat profusely even in mildly warm weather. This condition is medically referred to as hyperhidrosis. Excessive nervous stimulation of the sweat glands is thought to be the reason for hyperhidrosis. Shingles refers to a skin condition that occurs due to reactivation of varicella zoster virus in the body. This virus is responsible for causing the chickenpox. Even when the chicken pox disease subsides, the virus remains dormant in the nervous system of the affected individual. Due to unknown reasons, the varicella zoster virus becomes reactivated after many years or decades. A weak immune system is thought to play a role in the spontaneous reactivation of this virus. Some of the characteristic symptoms of shingles are itching, tingling, numbness, burning sensation, pain and tenderness in the skin. Fluid-filled blisters and red rashes may also appear on the skin. Dermatitis refers to an inflammatory immune reaction of the skin. Contact dermatitis is an inflammatory skin reaction that is precipitated by contact with certain irritants or allergens. Some of the common skin irritants that can cause contact dermatitis include soap, sweat, cloth material, metals and water. Prolonged contact with these substances can cause contact dermatitis in any person. An allergic contact dermatitis, on the other hand, occurs only in individuals who are hypersensitive to certain substances such as nickel, latex, chemical dyes, fragrances, and adhesives. These common substances act as allergens for hypersensitive individuals. Contact dermatitis is characterized by an itchy skin area that may also show dryness and reddish color. A burning sensation may also occur in the affected skin areas. Stretching of the skin on the abdomen during pregnancy may also cause an itchy abdomen in some pregnant women. An itchy abdomen during pregnancy may also be caused by physiological changes in the woman’s body. Read more on pregnancy itching. A variety of diseases can cause an itchy abdomen. Not all of these diseases are localized to the skin. Examples of skin conditions that can result in an itchy abdomen include fungal skin infections, atopic dermatitis, scabies, hives, lice, psoriasis and sunburns. An itchy skin may also occur in kidney and liver diseases. Creams containing urea to soothe and soften the skin. Emollients to soothe and hydrate the skin. Antibiotics and antimicrobial skin creams to treat skin infections. Maintaining proper skin hygiene by taking daily bath goes a long way in preventing many cases of itchy abdomen. One may also be able to prevent an itchy abdomen by choosing hypoallergenic soaps, mild perfumes, and suitable clothes. Applying a moisturizer to the skin in dry weather may also help.